As stated in our previously related blog, The Suffers made their national television debut on the Late Show with David Letterman last March, wowing late night host and in-studio audience with their contagious energy, enthralling vocals and undeniable talent, skyrocketing their musical career. Other television appearances include Jimmy Kimmel Live! and The Daily Show with Trevor Noah. It took 10-15 years for The Suffers to completely merge together, originally planning on being a cover band, later forming a unified, acclaimed band ranging in ages and musical styles. The Suffers were named in Buzzfeed’s “25 New Artists You Need in Your Life in 2015” after their EP release entitled Make Some Room. At the start of every show, “The Suffers all raise their arms in the air and scream as loudly as they can to psych themselves up.” Check out their pre-show “superman” routine below. The Suffers are making heads turn around the nation with every boisterous, colorful performance. Hope to see you at an upcoming show! Click here for remaining Levitt National Tour dates. 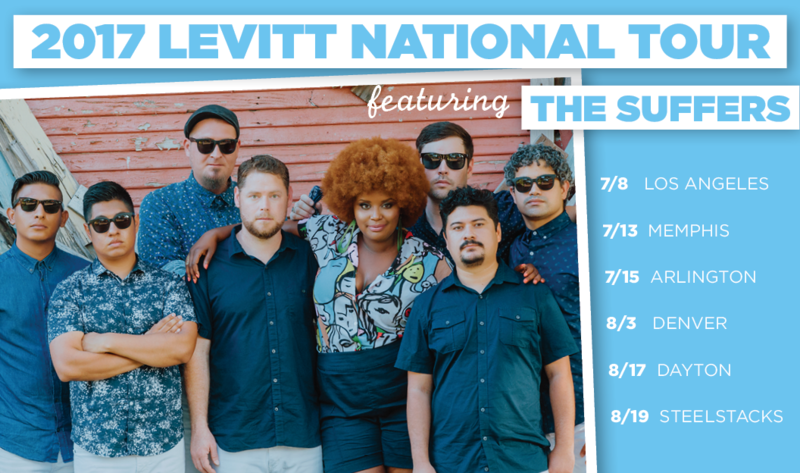 This entry was posted in Levitt National Tour and tagged Levitt National Tour, Levitt Pavilion Arlingon, Levitt Pavilion Los Angeles, Levitt Shell Memphis, The Suffers on July 12, 2017 by Cassie Ziegelbauer.